We are certified Escrima Concepts instructors, with many years experience and instruction from Master Steve Tappin, Paul Leslie (4th TG) and Wayne Tappin (4th TG). We are focused on the needs of the practitioner and love to teach everybody regardless of training experience. We will teach you the self-defence skills needed to protect yourself, your friends and family. We will help you get fitter and stronger. Your confidence, awareness, conditioning and coordination will all improve. You will gain all of this while learning effective self-defence skills. We expect all practitioners to respect each other and to respect our training environment. We are not training to compete against each other but rather to assist and help each other to progress through the system. 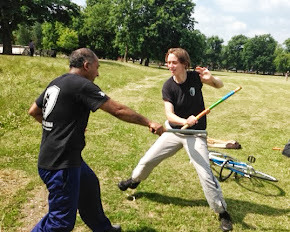 Originating from the Philippines, Escrima (also known as Kali and Arnis) is a realistic and effective self-defence system, it is unique in that the practitioner uses weapons from the beginning. Therefore your manual dexterity, coordination and reflexes will improve rapidly. We live in a society in which weapons are used widely in violent crime, understanding weapons can prove invaluable in protecting yourself. When facing a threat the human stress response is typically freeze, then flight or fight. During the freeze phase your awareness and alertness becomes heightened. Ideally you will be able to make an escape (flight phase). However, if you need to fight to escape, you need to be able to counter-attack quickly. With Escrima Concepts you don't need to shuffle your mind through a multitude of techniques in an emergency situation, you just automatically use the concepts you have learned. This enables you to defend yourself against all types of attacks such as punches, kicks, baseball bats, knives and bottles using one set of concepts which work for all, rather than individual techniques. Many systems teach stationary self-defence techniques. Real attackers continually move while attacking. Applying our concepts will prove practical in a real attack. You learn to deal with continually flowing pressured attacks from all angles. Escrima Concepts is an enjoyable but realistic combat system. You will have fun while getting fit and learning how to protect yourself. Don't Fear Change. Constantly Evolve.